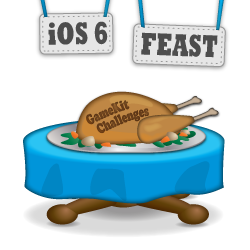 Note from Ray: This is the seventh iOS 6 tutorial in the iOS 6 Feast! This tutorial is an abbreviated version of one of the chapters from our new book iOS 6 By Tutorials. Ali Hafizji wrote this chapter – the same guy who’s written several Android tutorials for this site in the past. Enjoy! This is a blog post by iOS Tutorial Team member Ali Hafizji, an iOS and Android developer working at Tavisca Solutions. You’ve probably heard of Game Center, the online multiplayer social gaming network introduced in iOS 4.1. It allows users to invite friends to play a game, start a multiplayer gaming session, track game achievements, and a lot more. In addition to making implementing these standard social features much easier for developers, it also helps with a fundamental problem: app discovery. With over 1 million apps in the App Store today, the odds of a single user discovering your app can be frustratingly low. Game Center helps to solve this problem by allowing the user to see what games his/her friends are playing, thereby increasing the visibility of your game. When the friend receives the challenge, they will see the message along with a direct link to download your app. It’s not hard to imagine how this could increase user retention manyfold! When you consider the large number of players using Game Center, this alone is a very good reason to add challenges to your games. Before you can use challenges you need to use Game Center, so first this tutorial will take you through setting up Game Center and setting up a simple leaderboard, highlighting all the iOS 6 updates along the way. Note: This tutorial assumes that you have prior knowledge of Cocos2D and have built games using it. 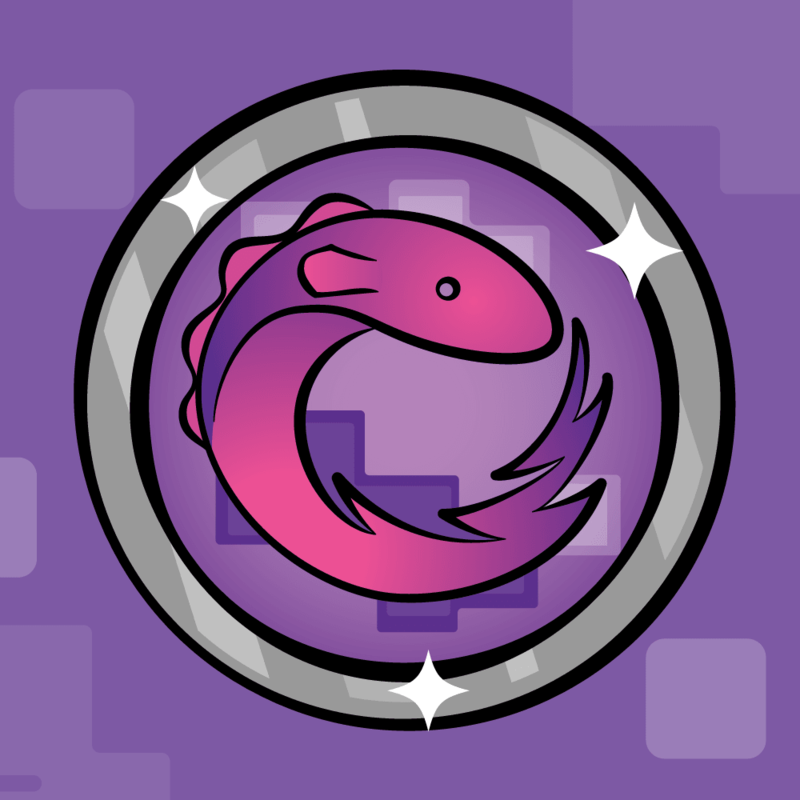 If you are new to Cocos2D, you can read some of the many Cocos2D tutorials available on this website. First download the starter project for this tutorial – MonkeyJump! MonkeyJump is a simple side scroller written using my favorite game engine, Cocos2D. 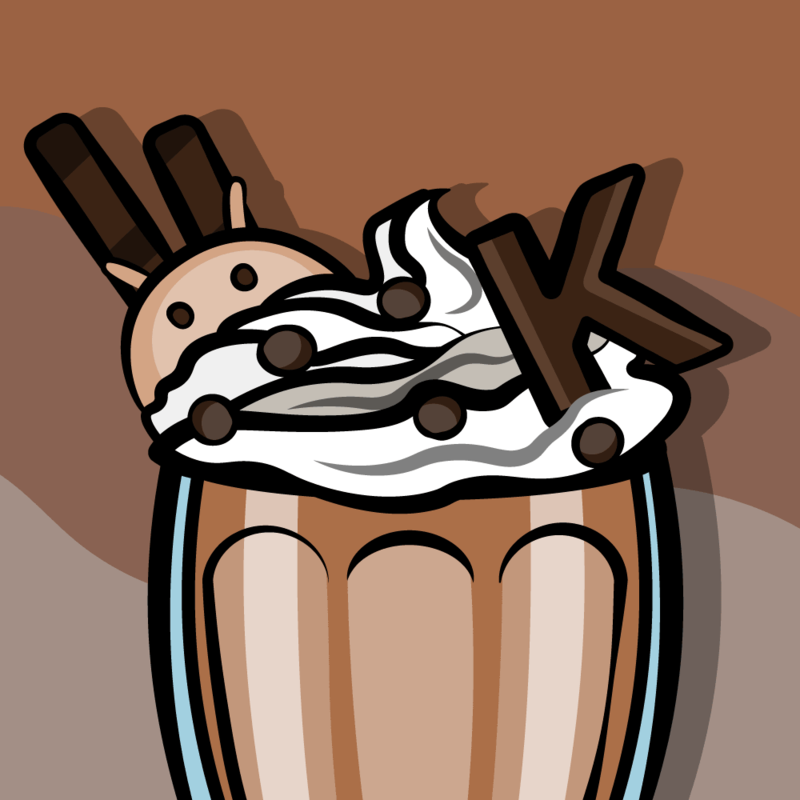 It was originally based on a simple game called CatJump developed for a Learning Cocos2D workshop, but I added some new features to make it more fun and added some cute new art from Vicki Wenderlich. The main character of the game is, obviously, a monkey :] The objective of the game is to make the monkey cover the maximum possible distance while avoiding as many enemies as he can. MonkeyJump is easy to play – even your mom could play! 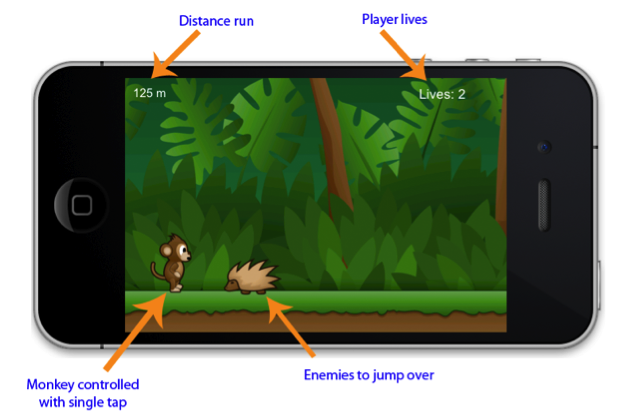 The player simply has to tap the screen to make the monkey jump over enemies. The game keeps track of the distance the monkey runs and uses it to determine the player’s score. Also go through the source code to understand how the layers and scenes work together. Create and set an App ID. Register your app on iTunes Connect. 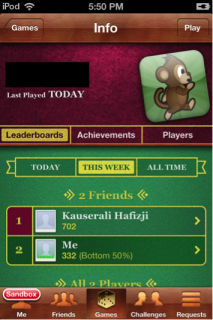 Enable Game Center features such as leaderboards. Let’s go through each of these steps in turn. This will be old hat for many readers, but I promise we’ll go through these necessary tasks quickly. The first thing you need to do is create an App ID. To do this, log on to the iOS Dev Center and from there, select the iOS Provisioning Portal. 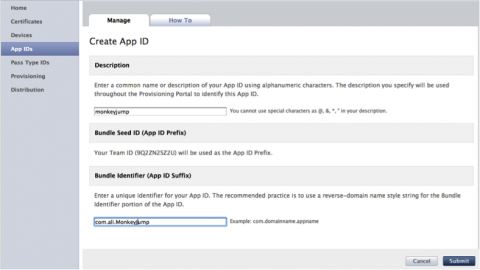 From the Provisioning Portal, select App IDs and create a new App ID. Use monkeyjump as the name and enter a bundle identifier – usually it’s good to use reverse DNS notation for a domain you control like com.ali.MonkeyJump (you can use your name if you don’t have a domain name). Once you are done, click the Submit button. Open the MonkeyJump Xcode project, select project root, then the MonkeyJump target (if it’s not selected), and in the Summary tab change the Bundle Identifier to the identifier you created in the iOS Provisioning Portal. Give the app a quick compile and run it on a device. If everything is in place the game will start right up. If it doesn’t, clean and build the project and try again. On the first screen, enter MonkeyJump as the game name, 400 as the SKU number (this can be any number/word, so if you want you can set it to something else) and select the Bundle Identifier you created in the previous step. You will need to upload a large app icon and a screenshot. To make the process easier, I have uploaded an iTunes resources file for you. You can extract the ZIP file and upload these to quickly finish the registration process. You aren’t done with this section yet – you still need to add a leaderboard. You might wonder why you have to bother with leaderboards since this chapter is about challenges – don’t worry, you will see why later! Enter the leaderboard reference name as High Scores and the leaderboard ID as HighScores. Note: I generally recommend you keep the leaderboard/achievement ID as an extension of the package name. For example, in the above case for me it would be com.ali.MonkeyJump.HighScores (you would need to replace the com.ali part to match your own setup). But for the purposes of this tutorial, just name it plain HighScores (without the reverse domain name prefix) to keep things simple. Adding an image is not mandatory, but is always a good practice. The one used above is included in the iTunes resources (it’s named icon_leaderboard_512.png), and you can use it here for the high scores leaderboard. When you’re done, click Save. Finally, click on the Done button. For now, one leaderboard is enough, but in the future if you want to add more, you now know the drill. 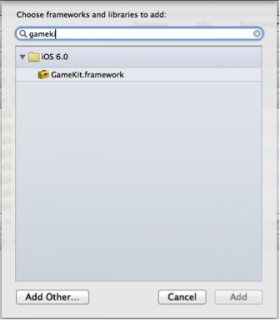 Before you start writing code, you need to import the GameKit framework. 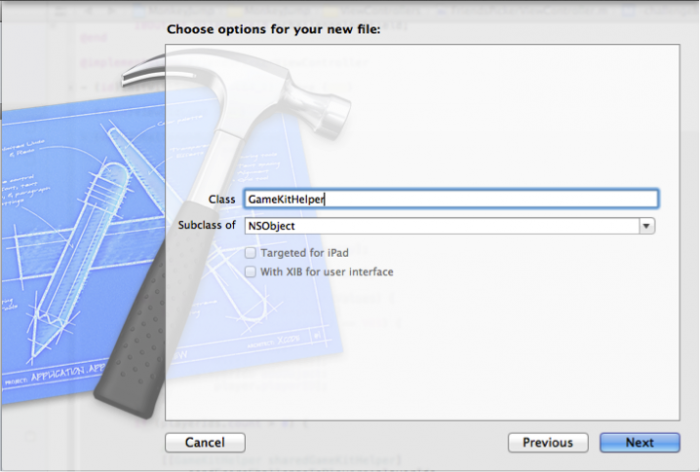 Open the MonkeyJump project in Xcode 4.5 and navigate to the target settings. Open the Build Phases tab and expand the Link Binary With Libraries section. Click the “+” button and add the GameKit framework to the project. Next you will write code to authenticate the player. Without authenticating the player, you cannot use any of the awesome features that Game Center provides. Player here means the user who is playing your game. 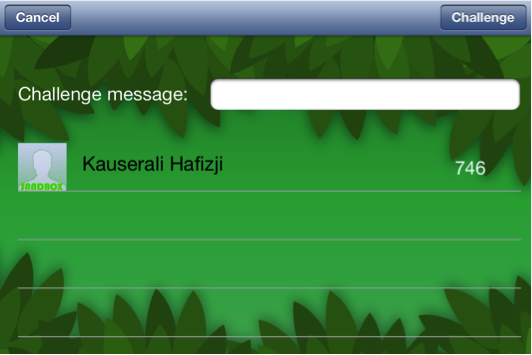 In Game Center terms, this is the GKLocalPlayer. First you make an authenticate call to the Game Center platform. The platform then asynchronously calls you back when authentication is complete. If the player was already logged in (95% of the time), a welcome banner is presented. If not, then a login screen is presented which also allows the player to register. Let’s write some code. 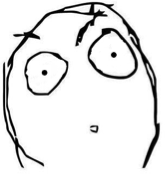 You are going to use a singleton pattern, so that all the Game Center code is in one class. 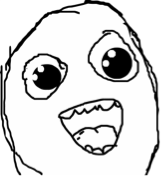 Right-click on the MonkeyJump group in Xcode and select New Group. Name the group GameKitFiles. 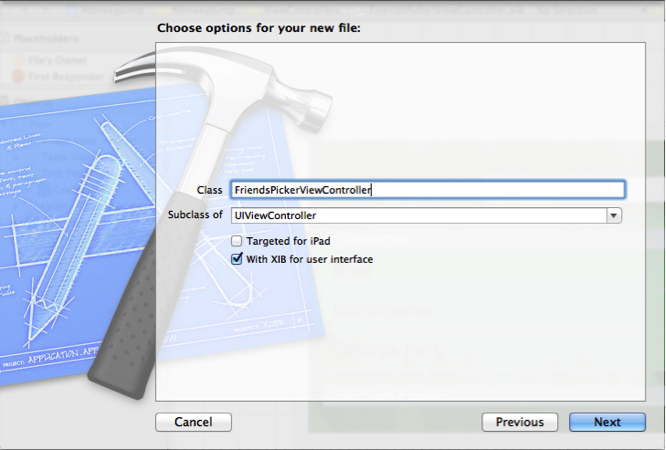 Next, right-click on the newly-created group and select New File…, then select the Objective-C Class template. Name the class GameKitHelper and make sure it extends NSObject. The code is self-explanatory and is heavily commented. All you are doing here is declaring two methods and two properties – one is the delegate, and the other will hold the last error that occurred while using the GameKit framework. You have declared a variable called _gameCenterFeaturesEnabled. This BOOL variable will be true if authentication was successful, and in any other case will be false. The way to authenticate a player has changed in iOS 6.0. All you need to do now is set the authenticationHandler of the GKLocalPlayer object, as seen in the -authenticateLocalPlayer method. The authenticationHandler is a block that takes two parameters and is called by the Game Center platform. When you set the authenticationHandler and request for the player to be authenticated. When the app moves to the foreground. On sign-in, i.e., if the player has not signed in before a sign-in screen is presented, any interaction on that screen leads to the authenticationHandler being called. An NSError object in case authentication happens to fail. Notice that in the block, you first check if the local player is authenticated. If the player has already been authenticated, then all you need to do is set the _gameCenterEnabled flag as true and get on with your game. If the login view controller (i.e., the first parameter of the authenticationHandler) is not nil, it means that the player has not logged into Game Center. If so, you first pause the game and then present the login view controller to the player. If the player logs in or selects the Cancel button on the login view controller, this handler is called again. Finally, if authentication fails you need to gracefully fall back and disable all Game Center features. This is achieved in this app by setting the _gameCenterFeaturesEnabled flag to false. The lastError property is declared as a readonly property. Hence, you cannot assign to it directly. So you need a setter method that will take care of setting the lastError property. That’s what setLastError: is. The Game Center login controller needs to be displayed to the user so that s/he can actually login. The presentViewController: and getRootViewController methods handle discovering the root view controller for the application and then displaying the login view via the root view controller. The image on the left shows the login view controller, presented in case the user was not logged in with Game Center. The image on the right shows the welcome banner, displayed every time an authentication call is successful. 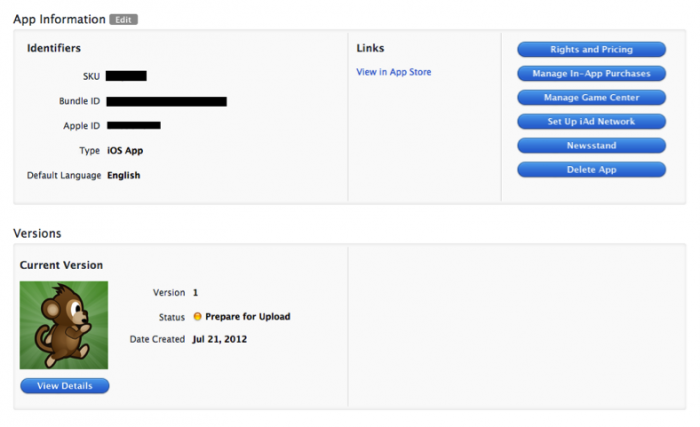 Note: To test the authentication, first logout of Game Center and then login through the MonkeyJump app. This will run Game Center in sandbox mode. Additionally, this probably will not work on the Simulator (at least, it didn’t work at the time of writing). You would need to test this on an actual device. 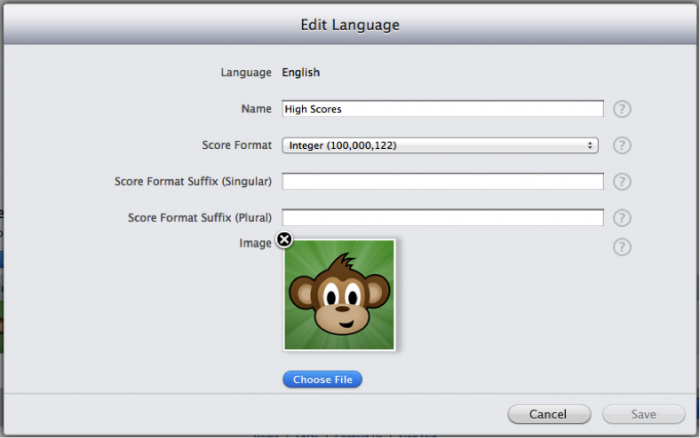 To send a score to Game Center, use the GKScore class. This class holds information about the player’s score and the category to which it belongs. The category refers to the leaderboard ID. For example, if you wish to submit a score to the High Scores leaderboard, then the category of the GKScore object would be the leaderboard ID that you set in iTunes Connect, which in your case is HighScores. Check to see if Game Center features are enabled, and execution proceeds only if they are. Create an instance of GKScore. The category used to create an object of GKScore is passed as an argument to the method. Set the value of the GKScore object. Send the GKScore object to Game Center using the reportScoreWithCompletionHandler: method. Once the score is sent, the platform calls the completion handler. The completion handler is a block that has one argument, in this case an NSError object that you can use to find out if the score was submitted successfully. Next, open GameLayer.m and find the method named monkeyDead. As the name implies, this method is called when the monkey dies. In other words, this is where the game would end. Now build and run the app. Play the game until the monkey dies. Poor little dude! Finally – the section you’ve been waiting for! Game Center challenges is the biggest new Game Center feature introduced in iOS 6.0. Challenges can help make your game go viral, and they increase user retention tremendously. The only problem is, integrating challenges is extremely difficult since the API is vast and complicated. Just kidding! To integrate challenges into your game, all you have to do is… ABSOLUTELY NOTHING! ☺ If your game supports leaderboards or achievements, it will automatically support challenges without you having to do any extra work. To test this, open the Game Center application (make sure you are in sandbox mode). Go to the Games tab and open the MonkeyJump game. If you have played the game a few times select your high score from the leaderboard. You will see a Challenge Friends button in the detail. Tap on it, enter the names of friends you want to challenge and press Send. When the challenge is sent, your friends will receive a push notification. Note: To test challenges, you will need two devices running iOS 6.0, each logged into Game Center with a different account, and the accounts need to have added each other as friends. Challenges are not mere push notifications. Let me briefly explain how challenges work with an example. Suppose I send a score challenge to Ray of 500 meters. Ray will receive a push notification on his device informing him of the challenge. Let’s suppose he gets a score of 1000 meters when he plays the game. In other words, Ray wipes the floor with the challenge. And he definitely wants me to know about that. Since the game reports all scores to Game Center, it knows automatically that Ray killed the challenge, so it will send a challenge completion push notification to both the devices. Ray can then challenge me with his 1000 meter score. Little does he know that I can do 1000 meters in my sleep. This process can go on indefinitely, with each party repeatedly topping the other’s score. It is because of this addictive, self-perpetuating use pattern that every game developer should integrate challenges into his/her games! Up until now, you’ve tested challenges using the Game Center application, but what if you want to allow the user to challenge his/her friends from within your game? That’s exactly what you’re going to do next. :] You will add this functionality to your game and allow the player to select which friends s/he wants to challenge using a friend picker. Open GameKitHelper.h and add a new property to it. This method is responsible for fetching the scores of all the player’s friends. To do this, the method queries the HighScores leaderboard for scores of the local player’s friends. Every time you request scores, Game Center adds the score of the local player to the results by default. For example, in the above method when you request the scores of all the player’s friends, Game Center returns an array containing not only the scores of the player’s friends, but the player’s score as well. So, you use the includeLocalPlayerScore property to decide whether or not to remove the local player’s score from the scores array. By default, this is NO (don’t include the player’s score). This method gets player information for a list of players by passing in an array of player IDs. This method sends out a score challenge to a list of players, accompanied by a message from the player. 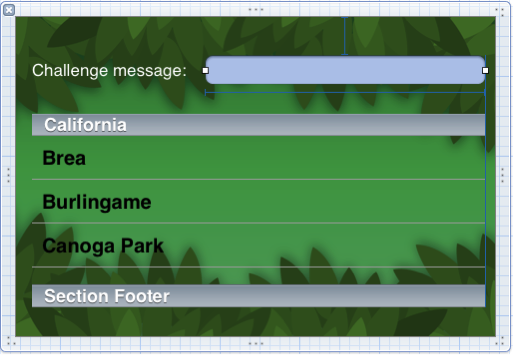 Open the FriendsPickerViewController.xib file, set the view’s orientation to landscape, drag a UITableView, a UITextField and a UILabel onto the canvas, and set the text property of the label as “Challenge message”. These two new data types, FriendsPickerCancelButtonPressed and FriendsPickerChallengeButtonPressed, describe the blocks you’ll be using. A block is like a C function; it has a return type (in this case void) and zero or more parameters. The typedef makes it a bit easier to refer to this block in the code. These properties represent blocks of code that will be executed when either the Cancel or the Challenge buttons are pressed. The method adds two UIBarButtonItems to the view controller, representing the Cancel and Challenge buttons. Now add the methods that will be called when these buttons are tapped. The above methods are easy to understand – all you do is execute the code in the challenge and cancel blocks. Before you can integrate this view controller into the game and test to see if everything works, you first need to write an initialization method that takes the score of the local player. But before you do this, you must define a variable to hold the score. This method presents the FriendPickerViewController modally. It also defines the blocks that will be executed when the Challenge and Cancel buttons are pressed. In this case, all that happens is that the view controller is dismissed. Here is the moment of truth! Build and run the game, play a round of MonkeyJump, and when you press the Challenge Friends button on the game over screen, you will be presented with the FriendsPickerViewController. If you tap on either the Challenge or the Cancel button the view controller will be dismissed. Great! Your game now has the ability to show the friends picker view controller. But the view controller does not show any friends, which kind of defeats the purpose. No need to feel lonely – let’s add this functionality! Next set the delegate and the data source of the UITableView, and the delegate of the UITextField, as the File’s Owner in Interface Builder. Repeat the process for the UITextField. An array named playerIds is created to hold the IDs of the local player’s friends. Then the method starts iterating over the returned scores. For each score, an entry in the data source is created and the player ID is stored in the playerIds array. If the score is less than the local player’s score, the entry is marked in the data source. The score is stored in the data source dictionary. The GameKitHelper’s getPlayerInfo: method is invoked with the playerIds array. This will return the details of each friend, such as the player’s name and profile picture. Next you need to implement the onPlayerInfoReceived: delegate method. This method is called when information for all the local player’s friends has been received. This method is also quite straightforward; since you have the details of each player, you just update the _dataSource dictionary with each player’s information. That’s a lot of code. :] But if you have used a UITableView before, the code should not be new to you. The tableView:cellForRowAtIndex: method creates a new UITableViewCell. Each cell of the table view will contain a profile picture, the player’s name and the player’s score. All the method does is set an entry in the _dataSource to YES or NO. The method first checks to see if the user has entered a message. If not, the border of the challengeTextField is turned red. If the user has entered text, the method finds the player IDs of all the selected players and stores them in an array called playerIds. If the user has selected players to challenge, then sendScoreChallengeToPlayers:withScore: is called from GameKitHelper with those player IDs. This will send the challenge to all the selected players. Build and run the game. 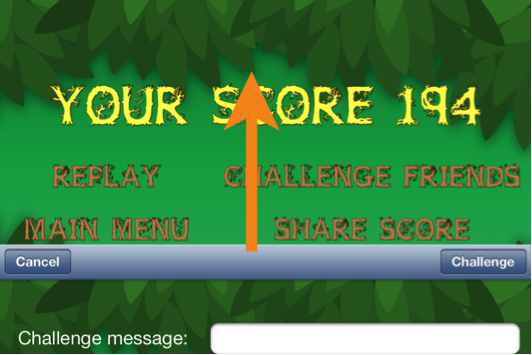 Now when you press the Challenge Friends button on the FriendsPickerViewController, it will send out a score challenge. If you have two devices you can easily test this to see if it works. Challenges unlocked! w00t - you can now send challenges through code! Here is the final project. 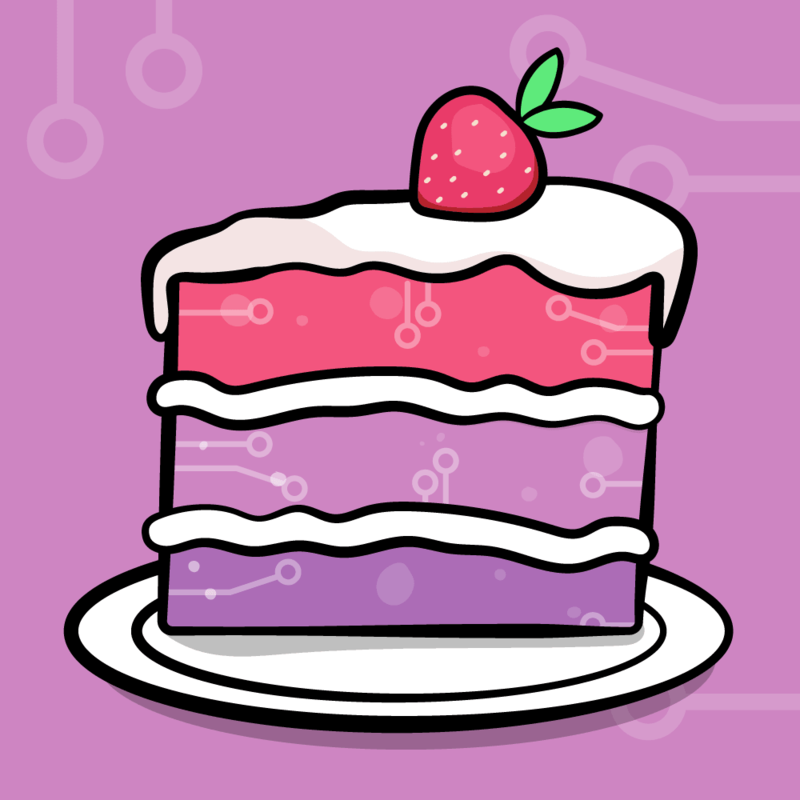 If you want to learn more about GameKit and all the awesome new things introduced be sure to check out our new book titled iOS 6 by Tutorials! Details on new classes introduced such as GKGameCenterViewController. 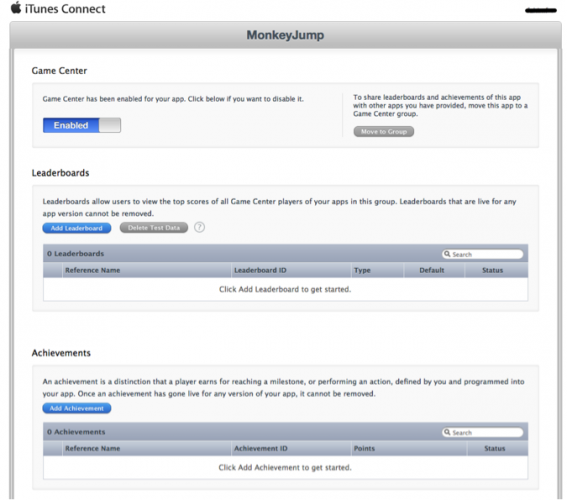 Setting up achievements for the monkey jump game and unlocking them through GameKit. 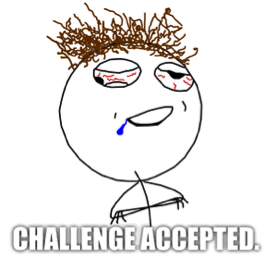 Sending achievement challenges to friends. Sharing score and achievements on social channels such as facebook, twitter etc. Adding the ability to record every move the player makes and sending that data along with a challenge. Adding a ghost mode that show every move the challenger made while you are trying to beat a challenge. So definitely check out iOS 6 by Tutorials as there a ton you will get to learn! In the meantime, if you have any questions or comments on this tutorial, please join the forum discussion below!